I stopped and drove right to the closest emergency veterinarian practice. On registration they asked her name; I didn’t know, but since the secretary had on pink scrubs I named her Rose. I have for many years said that if I ever hit the lottery I would start a fund, so that no one would ever have to choose between medical care and euthanizing their pet only because of finances. The veterinary practice would just call me and I would cover the bill. Well, I decided not to wait until I hit the lottery and I would start the charity anyway. With the help of so many generous people with amazing talents that have volunteered their services, Rose's Fund is a reality not just a dream. "At 1AM I got a call from the vet saying that they were very sorry but Rose had just passed on. I kept thinking that at least she died warm and cared for, not in the street being hit again, or in pain as the driver left her"
"On June 1, 2008 I was driving and saw a car go around something white in the road. 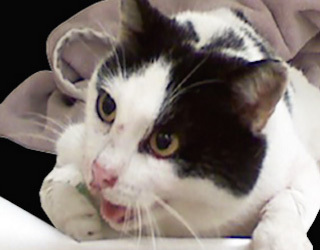 As I approached I saw that it was an injured cat that was bleeding but alive". The driver who hit her must have seen her as the car that went around did also. They said she had a broken leg but also some head trauma and her prognosis was guarded. They asked what I wanted to do, so I decided to have them give her pain medication and stabilize the leg and give her some time and also look for the owners. That night I spoke with the veterinarian who said Rose was stable, her breathing was better and the neurological issues seemed to be resolving. I never did find her owner, even though I left my number everywhere, put up her picture and even went door to door in the neighborhood where I found her. Many asked me why I would spend so much money on a cat that I had found, and the answer has always been that if anything ever happened to my pets, that is how I would hope someone would care for them. And it was the right thing to do. I decided to call this Rose's Fund, so that this lost cat’s death will serve to help others.